What Makes Louvers So Unique? How do louvers work? Turns out there’s a good deal of science behind them. It’s likely that you’ve seen louvers but perhaps you didn’t know what they were called. Defined by their large, angled slats, they’re metal structures used for similar functions as fences. A louver has some big benefits though, including promoting airflow, reducing visibility, and stopping other elements like dirt or debris. Since we’ve now defined louvers, let’s take a look at what makes them unique and try to get a better understanding for how they really work. Louvers are surprisingly complex. When they’re made, free area is calculated by taking the total open area of a louver—subtracting and adjusting for any obstructions like the blades and frame. This gives us a better understanding of how much obstruction is needed when creating them, as more obstruction can keep more undesirable elements out such as water or dirt. Ideally, louvers create a large amount of free area without letting too much water in. It’s also good to test for airflow resistance. To test this, air is run through a louver to see how much resistance there is. In some instances, like when installed around a generator or air conditioning unit, airflow is an important factor that determines whether or not a louver is suitable to install. Just like airflow, there’s a lot that goes into the science of how a louver works and how they treat waterflow. Many people use louvers to protect from the weather, as they are much less open than something like a fence, but still offer airflow. This is why a louver is ideal if you need to protect your commercial facility from extreme weather conditions. 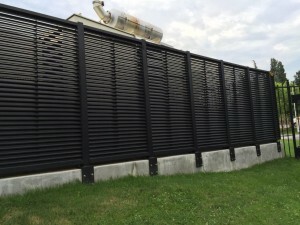 Louvers are backed by research and science to create a product that has a number of uses, from protecting generators to defining the perimeter of a commercial facility. Installing a louver promotes better protection against dust, dirt, water, and more—all while still allowing for great airflow if needed. When you are ready for quality louvers, the professionals at Hercules are ready to help. For more information and to learn how we can meet your custom louver needs, contact Hercules Custom Iron online or giving us a call at 1-800-331-2590. We will ensure your investment serves your family for years to come! For updates and to see projects we’re working on, visit us on Facebook, Twitter, LinkedIn, YouTube, Google+, and Pinterest. This entry was posted on Friday, July 20th, 2018	at 3:41 pm	. You can follow any responses to this entry through the RSS 2.0 feed. Both comments and pings are currently closed.